After birthing your baby you will experience a lochia flow. The first hours can be super very heavy, then the rest of the first week very heavy and then gradually reducing over the next 5-6 weeks ending up very light till lochia finally stops. Though of course every one is different. Furthermore, the experience after each baby can be different too. NB post partum bleeding also occurs after a c-section. Tampons, sponges and menstrual cups should not be used for post partum. For the first few hours, I recommend towels, terry flats or prefold nappies, old Tshirts - anything soft and absorbent. During the very heavy flow, there are two main styles of pads that people - longer (33, 37, 45cm) heavy absorbency all in one pads and post partum shells. 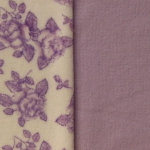 The shells are made with PUL and are very much like a nappy shell where the insert is laid on top. You can replace the insert and wash the shell after several reuses. Inserts can be shaped specially made ones, or you can repurpose things like face washers, thin hand towels, or cotton Tshirts. Toddler sized tshirts are ideal. If you do not have an older child, you might be able to beg some from friends and family with older kids or get a batch from the op shop. After the first week, then either the 33cm and 28cm pads are good - though some people switch straight to 25cm which are good for regular period use. 2-3 gussetted post partum shells (email me to discuss purchase of these), 2-3 37cm or 45cm pads, 3 x 33cm pads, 3 x 28cm pads, 3 x 25cm, 3 x 19cm. These pads have wide wings that snap around the crotch of your underwear to reduce leakage onto clothing and to keep the pads in place without sliding sideways or back and forth. Choose a length that suits you. For early post partum use, pads of 33cm and longer are recommended. Afterwards they are great for night time use. 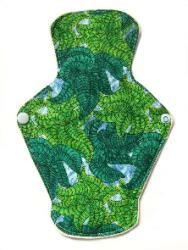 Pads for heavy flow are generally made with three layers of hemp/organic cotton which balances the absorbency with ease of cleaning and a reasonable time to dry completely. If you like these longer pads for liners or for moderate absorbency, then select one or two layers of hemp according to your needs. Most people choose a complete layer of concealed PUL for waterproofing in pads for post partum or heavy menstrual flow. Others find that a polar fleece backing for the pad is sufficient for moisture resistance and it is also more breathable. Choose from a variety of lovely fabrics for the upper surface of the pad (against your body) and the lower surface (which sits against your underwear). 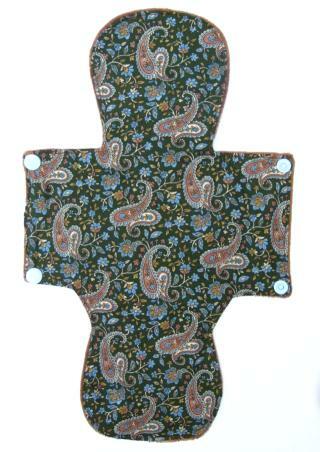 There is a comprehensive discussion of the different fabrics here within my Cloth Pad FAQ.